The sights and sounds around our little neck of the woods are ever evolving. After 40+ years of undeveloped land across our street Progress (?) has swooped in and has been busy making improvements (?) off and on over the last couple of years. They have been in full swing these last few months wiping out scrub trees, digging a deeper canal, misplacing (rudely kicking out I say) the deer and rabbits that have lived peacefully around us for years, and getting ready to build a Master Planned Upscale Community or something like that. I can't wrap my head around the fact there will eventually be homes built across the street from us, which means people (read: strangers) will eventually be moving in to our peaceful, private little paradise. 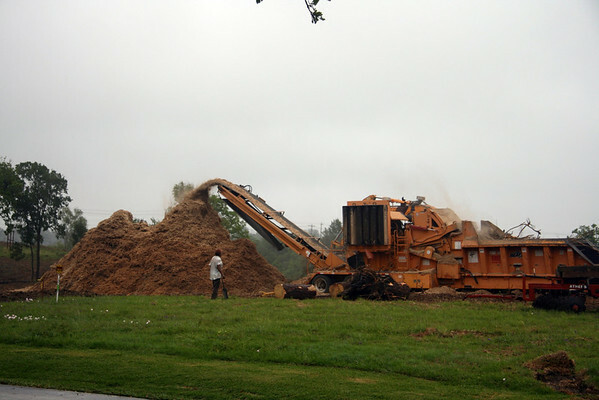 There are presently no less than six mountains of mulch staring back at me when I peek out our front windows, which of course hurts my heart. Change has been known to make me try and bury my head in the sand, although in this case I guess I'll be burying it in mulch. I've felt quite restless lately (maybe it's all the changes surrounding me) and haven't quite known what to do about it. So I've basically done nothing. Thoughts of sewing summer dresses for Annelise pop into my head and I've almost made it to the fabric store a few times, but I end up talking myself out of it fearing I would get stuck halfway through project anyway since it's been years since I've sewn clothes. But maybe I'll still give it whirl soon. Thoughts of sprucing up our house with new wall arrangements, pillows, bedding, framed pictures or cute craft displays get ignored because I can't (or at least shouldn't) justify spending money on stuff like that right now. The best way to feed this hunger would be to go garage sale-ing (yes, it's a verb), which I think Scott and Annelise would enjoy too, but that would require planning and actually getting up early and actually leaving the house as a family before 11:00 on a Saturday. Oh the pressure! Hobby Lobby did have their floral stuff on 50% off this week, so I treated myself to new flowers for our front door basket since our old hydrangeas grew mold last season. I'm not over-the-moon in love with this at all, it seems to stick up too high and kinda shouts, "I'm totally fake! 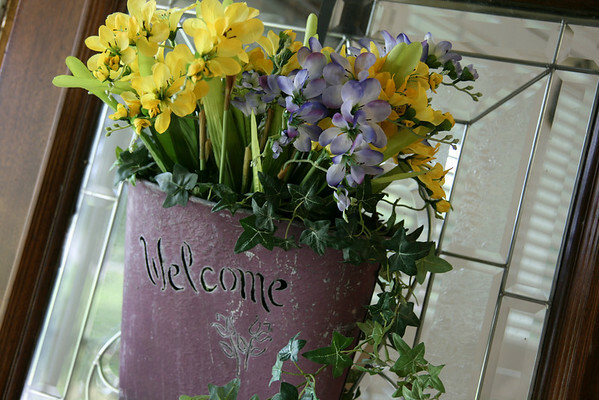 ", but the nicer stuff was still a little too pricey (since they might just grow mold anyway), so I went with this fake freesia. Maybe I should cut the stalks so they fit down in the basket more? 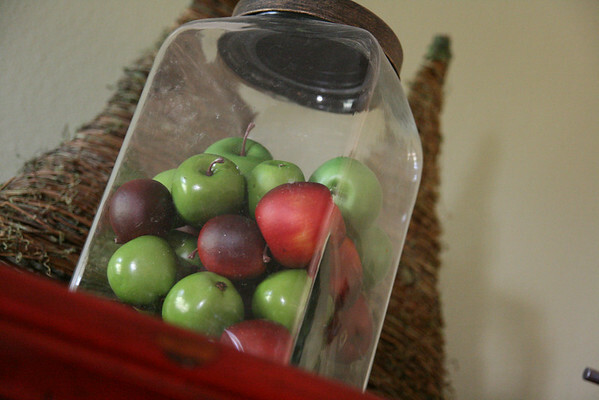 Since they were also 50% off, I bought red and green apples so the empty jar on top of our armoire will stop mocking me. It might also help if I dusted it, no? 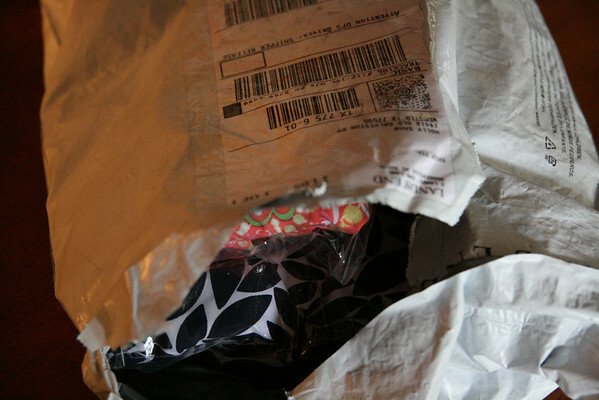 Those two small decorative changes curbed my restlessness a smidge, but not completely. I wish I was better at finishing craft projects instead of letting my creative energy fizzle out and watch the project die a slow, painful unfinished death. Yep, it's that time of year again: swimsuit season (GASP!). One tankini for me (a navy leaf print top and navy swim mini bottom with a cute ruffle hem, fingers crossed it fits) and two for Annelise. Even though Land's End suits are well made, they (at least the ones for kids) do get snaggly, this year I'll either rotate them or keep one in reserve for mid-summer pinch hitting. Speaking of swimsuits (yes, that painful subject), I think I am in total denial that my I'll be trying to wear one very soon. Maybe if I exercise every.single.day for 6 hours and eat nothing but celery I'll be ready. The last few months have been interesting (and frustrating) as far as my eating/exercising rollercoaster. As if I didn't know this already (denial rears its head again), I am addicted to sugar, plain and simple. All self control goes out the window and I start a downward spiral of binging on sweets and then remorse and self-loathing. When Scott and I were following Suzanne Somer's plan (which is basically high protein, no caffeine, no sugar and timing/separating protein and carbs) my body DID actually stop craving sugar. I can't tell you how much better I felt! Then we started on a slippery slope of thinking we could eat sweets and junk in moderation (cue hysterical laughter). And here I sit cranky, lethargic and puffy, not doing what I know works and what I know is better for my body. I feel like an alcoholic must feel, thinking, "If only I can make it to lunchtime without ____ and then mid-afternoon without _____ and night time TV watching without ______(that's the kicker right there)." The wheels come off usually by late afternoon, definitely by TV viewing time and I'm face first in a bag of Golden Double Stuf Oreos, etc. Okay, enough of THAT. I will do better today. I will be better today. I snapped this photo of Annelise this morning as she alternated bites of breakfast (hey, another scrambled egg--I'm on a roll!) 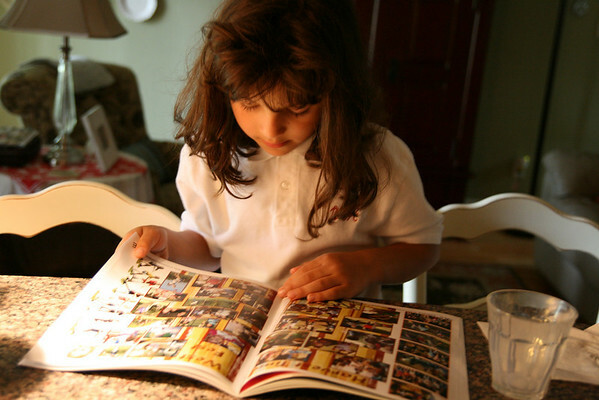 with peeks at her school year book from last year. If you look in the upper left corner, on the patterned chair, you'll see one of current Scott's best friends--a heating pad. For the past month or two he has had pain in his neck (but I promise it's not me) and shoulder and numbness down his arm that is ever so slooooowwwwly improving with a combination of physical therapy, chiropractic adjustments, home treatments of heat, ice, and even neck traction (yes, it's like he's 86 and our family room is rehab). He's also ordered what is supposed to be a miracle pillow (we'll see), requested and received a new ergonomic chair for work (which he neglected to realize he'd been sitting in it for FOUR days, so it must be really special), treated himself to a new ergonomic chair for our computer desk at home (and I'll admit it's pretty comfy) and is now embracing our friends to the east and having his first acupuncture session this afternoon. Not only do I hope it brings him some relief, I can't wait to hear about it since I've never tried it either (but as a possible peri-menopausal woman who fears her hormones are out of whack among a few other things, I might give it a chance soon). I found this note in Annelise's backpack this morning and asked her what it was. 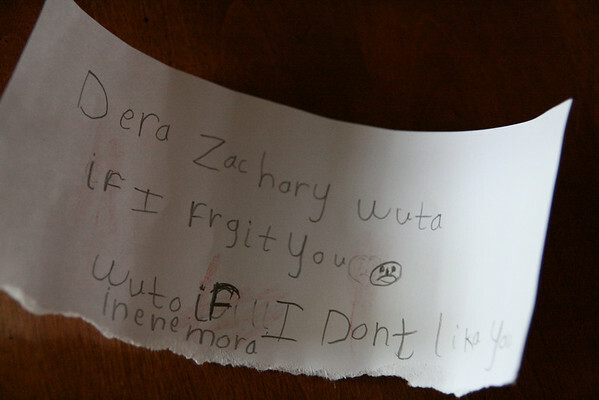 She explained it was a note she wrote for her friend Zachary at school. I HAD to document this since she wrote it all by herself and used, um...creative but phonetic spellings. Can you make out what she wrote? It says, "Dear Zachary, What if I forget you? (sad face), What if I don't like you any more?" I'm not sure what she meant by these questions, but she's obviously confused about their future. No matter how much we down play it, laugh it off, scoff, etc. she is determined that he is her *boyfriend* and convinced they will get married someday. He tells her that *stuff* too and draws her pictures occasionally, so it's not a one way affair and has been blooming since preschool (cringe). I'm not-so-secretly hoping they are in separate first grade classes next year. Last night Scott and Annelise went on a daddy-daughter date to watch an Astros game. Our preacher has season tickets and often invites people to go with him. He asked Scott, but since I'd made plans for a girlfriend supper at La Madeleine, Scott told him he couldn't go. Well, he generously invited Annelise to go along with the guys, so everything worked out perfectly, except the Astros lost. Scott did take the camera with him (he's a such a good bloggy husband!) and took a few pictures of Annelise, but forgot (chose not to?) to take any self-portraits together. 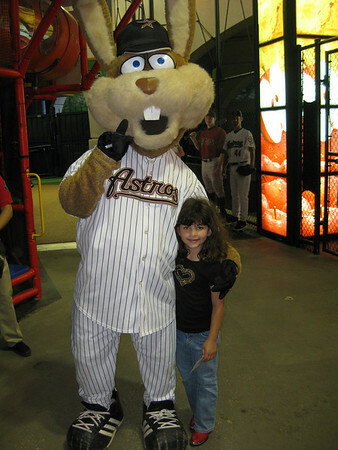 I'm not sure why, but the Astros mascot is a giant jackrabbit, otherwise known as Junction Jack. I don't really know what possessed me to think a post about mulch, decorating restlessness, swimsuits, sugar binges, acupuncture, love notes and baseball could be the least bit interesting, but when I started this mammoth word vomit I was obviously delusional. Please accept my earnest apologies. I'm blaming the mulch. And the sugar. Make sure your DVR is set!! I can't imagine that land across from your house being a subdivision. I know you will miss the privacy. On another note... just wanted to add my 2 cents worth about the neck pain. I use a water pillow that I got from my chiropractor. I LOVE it!! You fill the core with a little bit of water, you have to work to find the right amount for your own needs. It give just the right amount of support. I don't hear the water unless I'm tossing the pillow around (you try to get all of the air out, so that helps muffle any sloshing sounds). Also, wanted to share my acupuncture experience. When I was 9.5 months pregnant with Nathan (YES! 9 1/2 months!!!) My midwife suggested that acupuncture might help to induce labor. We went to an acupuncturist in Houston. He didn't seem phased by my request. Honestly, I didn't go into labor, but I did feel some twinges during the session. It was interesting, and didn't hurt at all. So weird to see so many little needles sticking out of my body, though. Nathan was born a few days later. Oh, one more thing... Chloe also had a boyfriend. They would write love notes to each other. It was so sweet. He told her than when he saw her he could hear the angles [angels] sing. LOL They were "boyfriend/girlfriend" for several years, until we moved.